What’s an I9 form and why do I need one? When I ask companies to review their I9 forms, this is a reaction I get too often “what’s an I9 and why do I need one?”. The I9 form is required by USCIS (US Citizen and Immigration Services) which is part of Homeland Security. 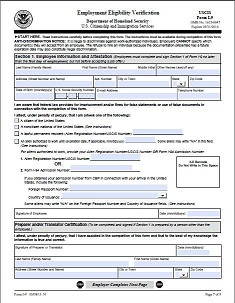 This form needs to completed by every employee and verifies they are legally able to work in the United States. The form itself is two pages – one for the employee and one for the employer. Typically what I end up seeing is companies are good about getting the employee to complete the form however it’s not always completed by the employer (page 2). Unfortunately while this may be easier for the employer, uncompleted forms are still a violation subject to fines. You either keep copies of everyone’s ID provided or no ones. Please don’t pick and choose which ones you will keep on file as you can then be subject to a discrimination claim. The employer must complete the form within the first 3 days of employment. Don’t put it off, while not a large fine – it’s still a fine. So why do you need one? Mostly because it’s been a federal requirement since November 6, 1986. Also since the I9 can audited by ICE, Department of Homeland Security, DOL, and others – you can be subjected to heavy fines which are calculated by employee. Imagine a $1000 fine by each of your 20 employees…is that how you want to spend $20,000? Need assistance in reviewing your I9’s for compliance? Contact us..
An Employee is Involved in a Violent Protest – Now What?